“Coffee for Consciousness,” by Vito Mucci is a powerful resource that gives us the skills to be prepared to deal with any situation. By learning how to expand our consciousness, we create new realities, so that we manage our life and learn how to handle different situations ahead of time, rather than just waiting to react to whatever comes our way. “Coffee for Consciousness,” contains a tremendous amount of usable information. 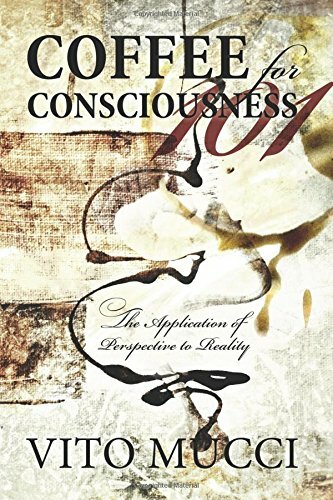 It obviously will take some effort to bring the life-changing perspectives into our consciousness, however, the author provides us with the tools to do so. From his own experiences, Mucci gained a lot of perspective in learning how to deal with any situation because of having PTSD, bipolar disorder, addiction, and anger management issues. Evolving from these issues into becoming a Shaman who is an expert in the Psychology of Consciousness shows that this stuff really works! Personally, I have read a ton of self-help books in my lifetime and this one is unique. It is more than just a book, because it provides you with the knowledge to understand why you are acting or reacting in a certain way and it gives you the means to overcome the issues that need work. It is not just something to read to make you feel better about yourself; it is a manual that shows you how to change your reality so that you are better! I thoroughly enjoyed reading “Coffee for Consciousness,” by Vito Mucci. I gained a lot of knowledge while doing so, however, now that I have an overview, I want to go back and slowly go through the information while taking notes so that I have a written plan for the lessons that I need to apply to my life. Trying to narrow this book down into a few paragraphs is so difficult because all of the information is incredibly valuable and I want to share it with everyone. I truly believe that I will use the tools provided within these pages to create a better life for myself. I love the idea of having a “tool bag,” from which I can use what I need as situations arise. I also like that this text provides a perfect combination of both emotional and spiritual help. Blending these two aspects together suits the areas that I need to work on to create a better world for myself.